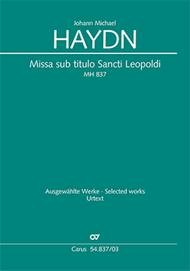 Missa sub titulo Sancti Leopoldi composed by Michael Haydn (1737-1806). Edited by Armin Kircher. Arranged by Paul Horn. For Soli SSA, Choir SSA, 2 Violins, Basso continuo, [2 Horns]. This edition: Paperbound. Score available separately - see item CA.5483700. Masses, Latin. Vocal score. Language: Latin. Composed 1805. MH 837. 40 pages. Duration 20 minutes. Published by Carus Verlag (CA.5483703).With Language: Latin. Masses, Latin.The Missa sub titulo Sti. Leopoldi pro festo Innocentium MH 837, written for the choir boys of the Salzburg Cathedral, was the last completed work of Johann Michael Haydn. Haydn composed more than thirty works to Latin and German settings for his "beloved choir boys" in a scoring for two or three treble voices. The composition of the Leopoldi-Mass was completed on 22 December 1805 and it "corresponds entirely to the strength of the hopeful pupils." On New Year's Eve in 1805 Haydn, who had long been sick and who suffered under the consequences of the invasion of the French, wrote to his friend Father Weringand Rettensteiner: "in spite of all the tragic circumstances, I still wrote a Mass for the children's festival, and I think they enjoyed it. ".